Two centuries ago, American explorers Meriwether Lewis and William Clark completed a famous and inspiring trek that would change the course of American history. The expedition, called the Corps of Discovery, set out from St. Louis, Mo., on May 14, 1804, to explore the vast wilderness of the Louisiana Territory, which had just been acquired from France, and beyond to the western coast of the new nation. Penetrating a territory known only through rumor and conjecture, Lewis and Clark’s team embarked on a perilous journey that would last 28 months, bring them up the Missouri River and lead over the Rocky Mountains to the Pacific Ocean and back. The 1803 Louisiana Purchase had doubled the physical size of the young country, but it was the explorers’ return on September 23, 1806, that truly opened up the territory for American expansion. In the 200 years since that historic trip, many have crossed the continent, but perhaps no one has retraced the footsteps as faithfully as FDU graduate Gordon Ward, BA’81 (M). In the 200 years since that historic trip, many have crossed the continent, but perhaps no one has retraced the footsteps as faithfully as FDU graduate Gordon Ward, BA’81 (M). Ward completed a 1,800-mile retracing of Lewis and Clark’s trail from Bismarck, N.D., to the mouth of the Columbia River at the Pacific Ocean, the boundary dividing Washington and Oregon. 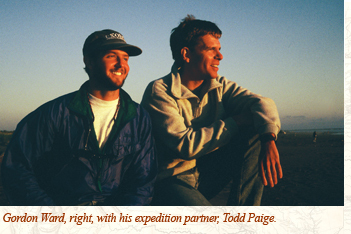 He and his expedition partner, Todd Paige, cycled, backpacked and canoed a winding ribbon of modern highways, gravel roads, wild and scenic rivers and mountain trails. 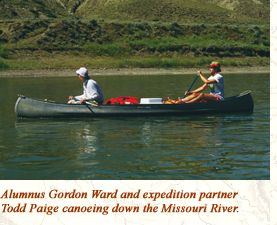 While their journey took place in the mid-1990s, their adventures have now been chronicled in the recent publication of Ward’s Life on the Shoulder: Rediscovery and Inspiration along the Lewis and Clark Trail. Ward, whose father, Warren, was a professor of biological sciences at Fairleigh Dickinson's campus in Madison from 1959 to 1981, describes himself as an experiential education specialist who “values the power of direct experience.” Combine that trait with a great passion for the outdoors, a worthwhile cause and a personal connection, and the allure of the trip was too great to resist. Ward explains, “Our journey was dubbed Quest West, and its original purpose was to raise funds for a scholarship at an independent school in New Jersey where Todd and I taught, something we succeeded in doing. Inspired by our friend Louis Starr, we selected the Lewis and Clark Trail because of his personal association with William Clark’s diaries. Starr inherited the documents after they were discovered in December of 1952 in a rolltop desk that belonged to his grandfather.” The historical papers today can be found at the Beineke Rare Books and Manuscript Library at Yale University, New Haven, Conn.
Lewis and Clark preserved their thoughts and exploration experiences in journals that are still read and enjoyed today as one of this country’s first written descriptions of the land west of the Mississippi River. Following this same formula, Ward wrote a detailed travel journal. In fact, Life on the Shoulder is presented in its original journal format, as a modern record of a journey completed in the very footsteps of the rugged Corps of Discovery. He adds that the trip was filled with many spectacular highlights, all of which were balanced with intense and unforeseen challenges. “There was a violent storm that halted our progress in central Montana,” Ward recalls. 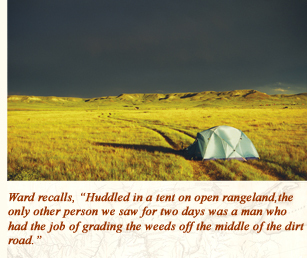 “Huddled in a tent on open rangeland, the only other person we saw for two days was a man who had the job of grading the weeds off the middle of the dirt road. “We learned from him that one of the roads we intended to take was impassable, and we had to alter our route. Making our way through vicious winds and away from the river, we found ourselves in an area with little water, and we were quickly becoming dehydrated. 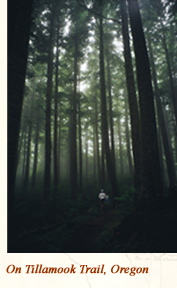 From the lush, northwest rain forests of the Cascades and the Oregon coast to the deserts of eastern Washington, Ward says he was in awe of the diversity of the West. It also became crystal clear how powerful the forces of nature really are. He remarks, “One can plan for a trip, but there are always unforeseen events that will punctuate and upset expectations and itineraries. “The White Rocks section of the Missouri River, with all its fantastic rock formations, was something we anticipated because we were going to be on the river in the same manner that Lewis and Clark had been. Little did I know that it was the place where I was to become very ill, and Todd would have to paddle me out and get me to a hospital. It turned out I had Lyme Disease, and, I was told, the first documented case in Montana. Since the trip, Ward has been busy writing and lecturing about his experiences. His next book, A Bit of Earth: Preserving Childhood, History, and a Sense of Place, is scheduled to be published in December. This collection of stories focuses on a small area of land where Ward was raised in Bernardsville, N.J., and emphasizes the importance of re-establishing roots by connecting personal lives with local history. Ward also has worked as a history teacher in the classroom and as a group transformation facilitator in the experiential education field, where he has offered team-building and motivational programs for 12 years through his own company. For more information on his books and presentations, see www.gtwservices.com.